The derma roller is a new innovation in the field of beauty that comes from China to help you treat your skin, correcting problematic parts such as wrinkles, cellulite, scars, stretch marks, etc. In a few words, it can “activate” the outer skin of the body by peeling and helps your favorite body creams to penetrate the skin. If you are looking for the best derma roller you have come in the right place. In this article we will show you the top models in the market to help you choose your ideal one. The Microneedle Roller is a very small, simple manual cylinder device (much like the electric roller probe used in beauty salons but much smaller) that has micro-needles made of surgical steel or titanium. These tiny needles are able to penetrate the pores of the upper layer of the skin without causing any damage to our precious skin. If you want to learn more about the realistic results of a derma roller you could read this excellent article from owndoc.com : Dermarolling:Hype VS Realistic Results. They are explained in detail with medical terms. —Caution: The Derma Roller is solely for personal use and you should not borrow your friend’s for obvious health and hygiene reasons—. You can see that it mostly has positive reviews and this is the one I personally use for my microneedling. There are also other good serums in the market with similar characteristics. You can make your own experiments and see what works best for you. When I started using derma rollers some years ago I purchased a very cheap model from an online store and almost quit using it because the quality of the product was not so good. It was poorly constructed and the needles started to rust just after some weeks of use. I decided to look for something of better quality. So I ditched my low quality rollers and purchased some better ones in order to get the results I wanted for my face. Based on my own experience, I created a list for you, containing the best derma rollers you can find in the online market in 2019. I have tried many of them personally and I believe that they are some models of top quality that will suit the needs of both beginners and experienced users. New rollers are coming in the market every now and then and when I find something worthy I will update this post with the new releases I find to be trustworthy. This nice derma rolling kit from Aurora Beauty has it all. The needles are made with high quality medical grade stainless steel and the roller has a nice handle to use it comfortably in any angle. It comes with 4 heads of 0.5 , 1.0, 1.5mm and 2.0mm and a dedicated disinfecting tank. The 2.0mm head is for use on scars. The 1.5mm head is for body use and has a wide surface with 1200 needles. The 1.0 head has 600 needles and the 0.5 head has 180 needles. It is also a CE certified roller like Angel Kiss and Youth Stream. Both the experienced and the starter users will not have any trouble to use it effectively. It comes with a bonus e-book manual with microneedling instructions from Aurora Beauty. I personally found the e-book helpful for those who are starting microneedling for the first time. Cleverwell Derma Rolling kit is a new elegant looking roller that I personally recommend because I believe it can cover all your microneedling needs. Its roller heads are made from medical grade stainless steel, something that makes a great difference in terms of quality and longevity. It has very good instructions for first time users. This is the device I am currently trying for regular use and I think it is a very well constructed roller that doesn’t have any of the problems and squeakiness that other cheaper rollers have. The quality of the micro-needles is high and I really love the design. It comes in a great price for a 5-in-1 device and the demand for this product is high. It includes 3 heads, with needle size of 0,25 mm. This kit is the next big thing in the microneedling world! One of the most popular choices, Koi Beauty stand-alone derma roller is a well constructed and elegant-looking roller that has a unique design and functionality. This roller truly feels professional and well designed. Its needles are made from titanium and they are very very strong. They are ultra sharp and they will last in good condition for a very long time! In the previous version You could choose 1 of the following roller sizes: 0.5 mm , 1.0 mm. In this version it comes in a 0.25mm size, something that makes it suitable for face and especially for starters. The handle is made from plastic but it does not feel like the classic cheap plastic that is ready to brake into pieces on your hand. It is ergonomic and steady. Reading the reviews online I noticed that there are no other rollers with the same design like Koi Beauty roller. Koi Beauty roller is the first one that appeared having this innovative design. If you see any other coming in the market having the exact same design, it will be a dupe. Angel Kiss Rolling kit is an excellent solution for both the experienced and beginner users. Angel Kiss is one of the first derma rolling brands that came into my knowledge, along with other big names like Dr Roller and MT Roller. Their newest kit is built with high quality and hygiene standarts and contains a sanitizing tank. This roller is an ideal solution for those who want to treat both their face and body. The needles are made from high quality stainless steel. It comes with 3 different heads. A 0.5 for under-eye area, a 0.1mm one for the face, a 1.5mm for the body. This rolling kit has a studry design and also comes with a sanitizing tank. Overall, a great derma rolling kit by Angel Kiss that has an excellent value for money and will not let you disappointed. A very effective and cheap solution for your microneedling needs is DRS derma roller. The needles are from pure surgical steel, allowing the safe sterilization. DRS derma roller has a pretty simple design with a nice curve on the handle, that helps to use in certain angles on face. It comes in 10 different sizes, starting from 0.20 mm to 3.00 mm . DRS dermaroller system is a trustworthy and economic choice that will cover all your dermarolling needs. Our next choice is PuruSkin Roller, a quality derma roller that has a lot of positive reviews online. It is an excellent roller with 3 different heads (0.5 mm – 1.0 mm – 1.5 mm) that will suit the needs for both the experienced users and starters. When I purhcased this model it was the first time I saw a derma rolling kit with 3 different sizes and this is one of its great advantages. It works very well and the only downside I can find is that it does not feel so “heavy” or quality built like Dr. Roller or Littleblack Cosmetic’s roller. But it is still a good structured device and already considered a classic in this field. Puruskin company also released the same model with 1 head and 2 heads to lower the cost for someone who does not need to buy all the three heads available. Another all-time classic, MT Roller is an excellent budget-friendly roller with titanium micro needles that comes in 6 different head sizes : 0.5 – 0.75 – 1 – 1.5 – 2 – 2.5 mm . For frequent use on face I suggest you the 0.5 or 0.75 head. 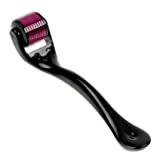 It is an old model that is very similar to New Spa Derma roller. I have not personally tried it but I intend to do so because it has excellent reviews anywhere online and everyone claims that it does great job for pimples, stretch marks,fine lines, acne and cellulite. Some buyers even claim to have results just after 10 sessions of use. and make your own judgement. Youth Stream is an established derma rolling brand that produced many models in the past. Their Skin Care Kit comes with 3 heads in 0.5 mm, 1.0 mm and 1.5 mm. and is distributed by Roller Plus. It is a new product for 2019 that does not have a lot of reviews yet, but following the successful formula of Youth Stream it looks promising. – The needles are made from high quality titanium pins and a disinfecting tank is included in the package. It is also very cheap comparing to the other kits in the market. Youth Stream derma roller is CE Certified . Also you could check our article about . After our derma roller reviews, we would like to present you an alternative solution that is also great for the skin, the Ice skin roller. An example of such a device is Heaven’s Bliss Ice Derma Roller. An Ice Skin Roller uses the ice therapy as an anti-aging treatment. Instead of micro-needles, it uses ice to achieve the same results like the ones achieved by the best Microneedle Rollers. Some people claim that ice therapy can provide the best anti-aging results, so I add this product in our review as an alternative solution and in order to give you some “food for thought” and investigation in case you are interested in something like this. Reading various ice roller reviews around the internet, reviewers claim that they have very fast and efficient results with this device and I’m on my way to buy one and personally try this method. This is also suggested to use after using one of the best derma roller to help the skin calm and relax and reduce the redness. If you are interested about this . I hope you enjoyed our article and our best derma roller reviews. Microneedling is a method that I personally use and I am very satisfied with the results it can give. If you liked it, don’t hesitate to share and subscribe in the Beauty Tonic. If you have any questions, I’m waiting your comments. I will try to update the products and the reviews often adding the next best derma roller I can find available in the market. You don’t mention Dr Roller. This is the best ! Hi paoli, thank you for your comment. Of course Dr Roller is one of the best available in the market. At the time you read the post I was making an update this is why you didn’t see it. I bought the 4-in-1 derma roller by Youth Stream as it was on your list as one of the best and was CE approved. One week later, I received it and now it’s not on your list. Why! Hi Carol. I had a technical issue with some of my posts lately, because I changed the server for my website to improve loading times. I tried to add a derma roller after Youth Stream and some conflict made the text disappear. I did not notice that, thanks for pointing this out I need to fix this asap. Youth Stream is a nice kit, how do you like it so far? Hi Rian. Thank you for the feedback. I suppose you use adblock this is why the links are not showing, because some of them are live links with current prices to make your selection easier. I will try to add some simple links for adblock users too. Hi Estelle, I enjoyed reading your reviews on dermarollers. I have always wanted to try dermarollering but do not know which one to buy and I have a couple of light rolling scars. What’s your best advice? Hi Gwendolene! If you have light scars and sensitive skin and for a first-time use I suggest you to use a roller with 0.5mm needle length. MT Roller is pretty good for beginners, or you could try one of the derma-rolling kits that have various heads. Youth Stream, Aurora beauty and Angel Kiss kits are all very good to use. Thanks for the info! I am new to Derma rolling and can’t wait to see what it does for the lines around my lips… I just received my Koi 0.5 roller and the instructions say to replace after 3-6 treatments or 30 days! Is that common on all rollers because that could get expensive unless they offer a replacement roller head so you don’t have to buy the whole thing again,. What are your thoughts/experience?? Hi Monica ! Thanks for getting in touch! Usually, when the roller is 6 months old it is time to take a closer look and examine the needles. You will understand when they are dull. I personally change my rollers every 6-8 months. The 0.5 Koi roller in the article has high quality titanium needles and it should last for at least 5-6 months. I have used this in the past but I don’t remember the instructions. I find it weird that the instructions say something like this. My suggestion is to use it normally and if you find out that it needs replacing sooner than 4-5 months, don’t buy the same again. About replacement heads, I couldn’t find any for Koi Derma Roller, but there are a lot of heads for other models (I found most of them on Ebay). 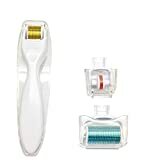 I have just started looking at these derma rollers and I am confused about prices and quality ? Some of the amazon descriptions say they are titanium needles, and then in the same description it will say stainless steel. Do you have a preference, and is one a sign of better quality over another ? I know you have reviewed a number of them, but could you list the ones you have had the best personal experience from. Thanks so much ! This is a very good question. Titanium rollers are generally stronger, but stainless steel rollers are better in terms of hygiene. Given the fact that these needles penetrate your skin I personally prefer stainless steel rollers. Some models like D.R. Beauty’s Angel Kiss roller offer both choices with their derma roller. My personal favorite used to be Little Black Cosmetic’s Roller but now I find it to be a bit overpriced (around $50) in comparison with other quality rollers, so I’m not going to order it again. Right now I use Angel Kiss roller kit and I am very satisfied. I suggest you to either go with this (choose stainless steel model) or one of the other 2 sets (Youth stream or Aurora Beauty). They are all very good sets, especially for beginners. Really enjoy your input. Just started derma rolling in January. I’m using the Koi .5mm. So far so good. Is the 1mm safe to use on your face as well? How often do you roll and how soon can you see any changes realistically? I have some deeper lines on my forehead and just starting to notice my marionette lines. Hi Susiekay! Yes you can use 1mm on face and a lot easier on hard spots like forehead. If you find it very painful for you, you could use numbing cream. It is recommended to use this needle length once every 4-5 weeks, in order to give time to your skin to heal. (also your skin will need about 3-7 days recovery time, because of deeper needle penetration.) It is an ideal legth to treat stretchmarks, scars, wrinkles and lines. Now, for results, realistically it will need at least 3-4 months to start seeing any major changes. Would you recommend rolling more frequently with a shorter needle or less frequently with a longer needle? I have a .25 roller and use it a few times a week but I’m considering purchasing one with longer needles thanks! Well, in depends on the condition you want to treat. If you only need to boost the absorption of topical skin products then the 0.25mm – 0.30mm will do the job for you. If you want to stimulate collagen production and treat shallow imperfections then 0.5mm is the perfect fit. If you want to treat wrinkles, stretch marks and medium-deep scars then you should use a 0.75-1.00mm derma roller. You could also continue rolling more frequently with your 0.25 roller and also roll less frequently with a 0.5 or 0.75 roller. What about the AcuLift derma roller? I understand this is a superior product actually invented by an acupuncturist, with titanium needles and sterile packaging. How does it stack up against the others? Thank you for your reviews, and waiting for your next update on the best rollers. I’m 50 years old and interested in purchasing a derma roller for around my eyes and jawline. Stainless steel sounds the safest but what size of roller and how often should I use a roller to see results in these areas? I would like to use deram roller for scalp (hair loss) I am going to use for 1st time could you please suggest me which one should I buy(0.25,0.5,1m or and 1.5mm) needles count ? and how many times should I use per week? I use RX Tretinoin cream 0.1% now. Is it OK to start with Derma Roll?